With its unique place in legend and lore, and with strength and brawn befitting the continent’s top predator, the jaguar invokes the depths of imagination. That such a large cat is out there somewhere in the wild is deeply reassuring. Yet with the jaguar having been almost completely extirpated from the U.S.-Mexico borderlands, NJP knows the time is upon us to bring back the jaguar. NJP strives to preserve essential jaguar habitat through the establishment, care, and expansion of a safe-haven sanctuary in northern Mexico. We aspire to restore habitat suitable for jaguars and other threatened and endangered species, to support wildlife research and educational programs, and to reduce conflicts between carnivores and humans. Our goal is to instill pride and respect for regional biodiversity among those dwelling in jaguar country and to dispel any myths and misconceptions about the species. We recognize that curtailing hunting and trapping of jaguars is the most time-sensitive need for species recovery throughout the region. 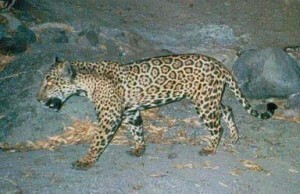 As we launch conservation initiatives at and near the Northern Jaguar Reserve in Sonora, we are simultaneously envisioning how jaguars will one day return to former habitat in the U.S. We are in the process of identifying and hope to maintain safe-passage corridors between the reserve and the international border with Arizona and New Mexico.